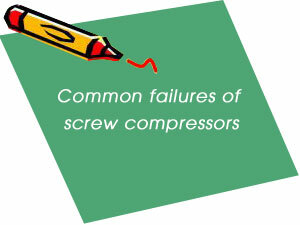 There are three common faults of screw compressors: motor overload, high temperature, gas-guzzling. Three filters (air intake filters, oil filters, oil separator) severe blockage; minimum pressure valve seal failure, resulting in a load when the motor starts encounter; when starting, vent valve is not open, the intake valve is not closed. Oil filter clogged, thermostatic valve spool jams, internal or external oil cooler is seriously polluted. Oil filter and oil cooler mounted thermostatic valve upstream of the oil is an effective way to avoid failure, but most brands of screw air compressors’s oil filter only be protected for air end. Thermostatic valve is mixed by cold oil with hot oil. In any part of the heat will allow the temperature of the refrigeration oil mixed with the oil, so greatly reducing the efficiency of the cooling system. Fan thermostat higher than with a start-stop reliability and efficiency thermostatic temperature control system. Return pipe clogged oil core rupture, low exhaust pressure for a long time. First, check the occurrence of gas-guzzling tank pressure is stable in the vicinity of ratings; Second, check the return pipe temperature is normal, low temperature shows the oil return orifice blockage, is off the main pollutants from the oil tank on the oxide.